After salt and pepper, parsley is perhaps the most common seasoning in Western cookery, a mainstay of salads and finishing garnishes in a wide array of cuisines. Despite its ubiquity, however, this biennial herb is sometimes considered an afterthought when it really deserves more recognition for its great nutritional value and time-tested medicinal use. Preventing urinary tract infections. Parsley is a great diuretic, and its antibacterial properties have been traditionally used to prevent and treat bladder and kidney problems. Additionally, parsley is highly effective for treating respiratory conditions, such as asthma, running nose, and congestion. It is also said to help in treating inflammatory diseases, such as gout, rheumatism, and arthritis. Furthermore, research supports the ability of to reduce menstrual pain by inducing menstruation, as well as aiding bone formation and reducing blood pressure. Parsley is an efficient diuretic and digestive aid, particularly beneficial to the kidneys. Active compounds identified in Parsley and phenols and flavonoids, particularly apigenin; as well as essential oils - mainly myristicin and apiol - and coumarins. Apigenin, a flavonoid found in the leaves, is responsible for the anti-inflammatory, antiviral, and purgative effects of the herb, while myristicin and apiol are the major constituents of parsley seed oil, and both exhibit antioxidant activities. The coumarines contained in parsley have shown antimicrobial activity against a number of bacterial strains, such as Bacillus subtilis, P. aeruginosa, S. epidermidis, S. aureus, and Saccharomyces cerevisiae. Parsley's nutritional profile is also responsible for its strengthening, tonic properties, as it includes vitamins A, B3 (niacin), B6 (pyridoxine), B9 (folate), C, E, and K, as well as a high concentration of essential minerals like iron, potassium, magnesium, calcium, and zinc. Other herbs with antibacterial properties are stonebreaker and calendula, while asparagus also help prevent iron deficiency. For medicinal purposes parsley should be taken under medical supervision. While it is commonly used to treat iron deficiency and urinary tract infections (UTIs), the over consumption of parsley can cause anemia, as well as liver and kidney problems. 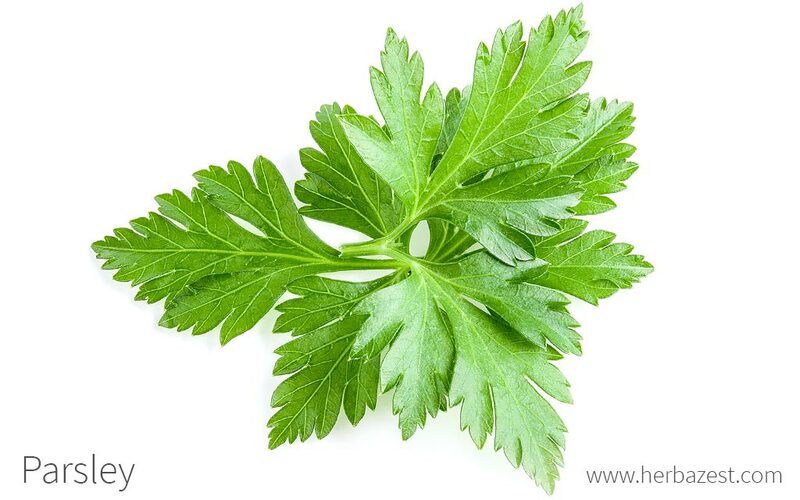 Parsley seed oil, when applied topically, can also cause skin irritation and worsen sun burn. Pregnant women are warned against excessive consumption of parsley, since that can result in miscarriages and trigger menstrual flow. Because it can thin blood, parsley should not be consumed when taking anticoagulant drugs or prior to surgical procedures. Parsley can be consumed in a variety of ways in order to benefit from its nutritional value. Whether it's used as a culinary spice or taken in its supplemental form, parsley should be consumed based on individual needs and purposes. Raw. A main staple in many dishes globally, adding fresh parsley to food can aid in digestion due to its chlorophyll content. It is also high in vitamins A, C, and K.
Infusion. Whether brewed from its leaves or mixed with other herbs, parsley brewed in tea has high medicinal value because of its diuretic properties, which can aid in removing various toxins from the body. An infusion of parsley is said to be useful for treating gallstones. Essential oil. Because of its anti-inflammatory properties, parsley essential oil can be used for a number of purposes, including relieving joint and arthritis pain. Liquid extract. The chlorophyll content found in parsley makes this preparation great for aiding digestion. Capsules. This supplemental form provides standardized doses that can be taken daily to promote digestion, reduce general inflammation and treating iron-deficiency anemia. Dried parsley is one of the most widely-used herbal seasonings in the world, and it can be found in most grocery stores and supermarkets throughout the year. Fresh varieties are available in similar locations, as well as in many farmers' markets, during spring and summer months. Specialized health food stores and some major chains are capable of carrying it fresh year-round. Available as essential oil, liquid extract, and capsule form, parsley remedies and supplements are easily found in many specialized health stores and online suppliers, which offer a wider selection of brands and prices. PARSLEY SUPPLEMENTS ARE OFTEN COMBINED WITH GARLIC. Native to the Mediterranean region, parsley is a biennial plant which thrives under temperate conditions, ideally between 50 - 70°F (10 - 21°C). However, it is a hearty plant that can survive if there is a deviation in temperature. Ideal temperatures for growing parsley are between 50 - 70°F (10 - 21°C), though it will survive the light frost of early spring. Parsley prefers fertile, well-drained soil with a pH of 6.0 - 7.0. Fertilizers or organic matter should be constantly applied. The area around parsley plants should be weeded often in order to avoid competition. Parsley propagates directly from seeds. Germination will occur between two and six weeks. Frequent watering and full sunlight exposure are required. Snipping stalks near the soil will allow for continued growth after each harvest. Detailed information about growing parsley can be found in the herb garden section. The stems of parsley can measure up to one foot (30 cm) long and feature radiating rosette leaves, umbels of small white flowers during periods of pollination, and ribbed seeds. Curly and flat foliage are equally common. Parsley (Petroselinum crispum) is officially a member of Apiaceae, also known as the parsley family, along with 3,700 other species, including many well known aromatic and culinary herbs, such as anise (Pimpinella anisum), carrot (Daucus carota), celery (Apium graveolens), dill (Anethum graveolens), and fennel (Foeniculum vulgare). Although it belongs to a different genus, the closest relative of parsley is parsnip (Pastinaca sativa), which is also similar to carrot. Italian or flat-leaf parsley (P. crispum var. neapolitanum) is most commonly used as seasoning for its stronger flavor and easy home growth, resembling originally wild strains. Curly leaf parsley (P. crispum var. crispum) is preferred as a garnish or decorative interest. Hamburg parsley (P. crispum var. tuberosum), found primarily in central Europe, has significantly thicker roots and is often eaten as a vegetable in soups and stews. Parsley is native to the Mediterranean regions of southern Europe and northern Africa, first cultivated approximately 2,000 years ago in ancient Greece and Rome, where it was associated to mythological traditions and used as a digestive aid. The Middle Ages saw its migration to other European countries as it reached Britain in 1548, where it grew in popularity as a mask for unpleasant oral odors. It has since been welcomed and naturalized worldwide. Due to high demand within the food industry, parsley is a major export crop for many countries in its native zones. Italy, Spain, and Greece boast significant revenue from the crop, though the Netherlands - which generates 22% of all spices grown in Europe - has led the way in recent years. India also produces a large quantity of the herb, gaining more from fresh varieties than selling it pre-dried. The plant was considered a sacred religious symbol long before its first employment as a seasoning. Ancient Greeks first used parsley to adorn the tombs of loved ones and the brows of athletic champions, linking it to the transience of life. In ancient Rome, parsley was associated with the goddess Persephone, queen of the underworld, and was used in funeral ceremonies. Gardening. Parsley is a favorite of amateur herb gardeners for its practical benefits and ability to attract wildlife. Butterflies, bees, and other nectar-feeding insects are drawn to the pollen of its flowers, and some birds are known to feed upon its seeds.